Once again there was never a dull moment at Victoria Park, with 2008-09 another roller-coaster season of highs and lows. Co-managers Lindsay Rathie and Robbie Clark assembled a strong squad that was many pundits tip for promotion to the East of Scotland Premier Division. The previous season’s promotion winning side from Peebles had broken up and the management looted striker Chris Graham, midfielder Mike Osborne, young winger Andy Martin and defenders Paul Lee and Gavin Tainsh. The club received another boost as influential playmaker Steven Notman extended his stay in Innerleithen for another season. Departing was Ross Alexander to Civil Service Strollers, Colin Smith to Leithen Rovers and Creag Robertson to Stirling University, while the Loanhead-based trio of Scott Johnston, Lewis Montgomery and Mike MacKale all left after three seasons at the club. The East of Scotland First Division saw some changes, with Berwick Rangers Reserves dropping out after a single season, to be replaced by Stirling University. Annan Athletic’s move upstairs to the Scottish Football League after the demise of Gretna created a further vacancy, which was ironically filled by Gretna 2008 – an entirely new club formed by the Gretna Supporters Trust. Another new name was that of Leith Athletic, after the popular community club had merged with Edinburgh Athletic. Vale’s pre-season couldn’t have got off to a better start as they met SPL side Cowdenbeath in a friendly. The Fife side included several first-team players in their line up and although Vale weren’t quite at full strength themselves, doubles from Aaron Somerville and Chris Graham saw them register a fine 4-0 win. A couple of weeks later saw Shields United, a recently formed club from South Shields playing in the Northern Alliance League, visit Victoria Park for the first time and another two goals from Somerville saw another win. A further victory followed over Edinburgh amateur side Links United and regular pre-season opponents Kirriemuir Thistle also made the trip to Innerleithen and the sides fought out an exciting match that ended tied at 3-3. The final preparation game saw a young Motherwell side visit Innerleithen for the third year in a row. Robert McHugh gave the Lanarkshire side the lead after quarter of an hour and they doubled their lead with a Mark Archdeacon penalty. Another penalty, this time from McHugh put ‘Well 3-0 up, before Somerville struck to pull a goal back for Vale just before half time. Ross Forbes added a fourth during a second half in which Motherwell completely bossed the game. It meant that Vale had lost their unbeaten pre-season record, but it was no disgrace losing to such a talented side. Five days later, the real action began as the curtain came up on the East of Scotland League season. Vale’s first game was a tough one away at Craigroyston, who had been relegated from the Premier Division the season before. Vale made a great start, taking the lead through Ryan McManus in the third minute and although James Binnie equalised for the home side, Vale went on to have the better of the first half before Kyle Hay shot home just before half time to put Craigie in the lead. In the second half, Mike Osborne received his second booking for a lunge at David Jeffrey and the Vale challenge collapsed as further goals from Binnie, Sammy Hassan and Jordan McKenzie saw Craigroyston run out comfortable winners. The next league fixture was a local derby at home to Gala Fairydean and Vale got off to a nightmare start as former player Des Sutherland fired home a stunning goal in the fifth minute, but Vale picked themselves up and were again the better side in the first half. Sutherland added another in the second half, but shortly after this, Mike Osborne tangled with Gala’s Scott McKenzie and it descended into a brawl featuring almost every player and most members of the technical area. Once the dust had settled, Vale players Raymond Fleming and Chris Graham were red-carded for violent conduct and manager Lindsay Rathie and his Gala counterpart Derek Hancock were both sent from the dug outs. Fairydean were on easy street against nine-man Vale and Jamie Gibson added a third before another Sutherland strike rounded off a miserable afternoon. 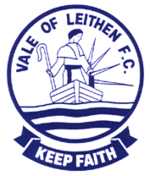 The following week saw the visit of Leith Athletic, with Vale again finding themselves a man down after Ronald Fleming picked up two yellow cards before half time. Athletic took the lead three times and three times ten-man Vale equalised, but striker Steven Radzynski completed his hat-trick late in the game and there was no way back for the Innerleithen side. It would prove to be Vale’s last league game for three and a half months, during which time they sat bottom of the First Division on zero points. In the SFA South Region Challenge Cup, Vale survived a late rally from Glasgow University to win 3-2, but lost out to Edinburgh City in the next round with further red cards given to Mike Osborne and Campbell Forsyth. The draw for the Scottish Cup, in it’s first year sponsored by Homecoming Scotland, paired Vale once again with Glasgow University. It proved to be a tighter game than the South Region Cup tie six weeks earlier, with only a late goal by substitute Greig Shortreed separating the sides, although a serious injury to Andy Martin which caused the game to be held up for half an hour while paramedics were called to the scene, cast a bit of a shadow over the result. The Image Printers East of Scotland Qualifying Cup saw another visit to Victoria Park by Edinburgh City in the Second Round. Having run the Citizens close in the South Region Cup, Vale produced possibly their best performance of the season to crush the capital side’s challenge. A first half double from Aaron Somerville saw Vale ahead at the break, but a mad start to the second half saw City reduced to ten men, then draw level with a strike from Robbie Ross and an own goal from Gavin Tainsh. But ten minutes from time, Somerville struck again to put Vale back in the lead, added his fourth a minute later and substitute Craig Dewar made it five in the final minute. As Vale looked forward to a quarter final meeting with Eyemouth United, it emerged that Vale had unwittingly fielded an ineligable player. Captain Campbell Forsyth, who had been red-carded in the South Region Cup game, served what had been believed to be his automatic one game suspension in the Scottish Cup game against Glasgow University, but it transpired that Forsyth would have been able to play in that game, but not in the next game under the auspices of the East of Scotland Association. Secretary Alex Currie took full responsibility for the oversight and owned up to the association, but whoever said honesty doesn’t pay was right as Vale were treated far more harshly than other clubs who had committed similar errors in the recent past by being kicked out of the competition, hit with a fine and Forsyth himself burdoned with an extra game ban. Vale faced a trip to Muirhouse in the Second Round of the Scottish Cup for a meeting with Civil Service Strollers. After monsoon conditions forced a postponement at the first time of asking, the game went ahead the following week with ex-Hibernian player Geri Rossi making his long-awaited competitive debut for the club, while Andy Martin came on as a second half substitute – his first appearance since the injury against Glasgow University in the previous round. A tight game played at a frantic pace saw some poor finishing from both sides, but a 77th minute volley from Aaron Somerville defeated Strollers, who had ex-Vale midfielder Craig Dickson red-carded late in the game. In mid-November, the weather relented enough for Vale to at long last get back to league action, and they lifted themselves off the foot of the First Division with victories over Ormiston and Civil Service Strollers. But the club were set for a turbulent period off the park, as they firstly learned of the death of former player Alec Lucas – killed by an explosive device as he served with the Marines in Afghanistan – before the saga of their Scottish Cup Third Round tie. Drawn against Highland League side Inverurie Loco Works, the tie was originally scheduled to take place on October 29th. Vale travelled up the day before, staying in Aberdeen on the Friday, but even as the coach made it’s way northwards, it seemed it would be a miracle if the game was on. In the event it wasn’t, with the Harlaw Park pitch frost-bound. The following Saturday Vale travelled up on the morning of the game, and arrived to find the pitch with some light surface frost, but playable. Not so according to the referee, who took the decision to put the game off after one of his assistants objected to the slippery condition of a line of astroturf on the touchline. Inverurie officials asked for a little time to rectify the problem, but the plea fell on deaf ears and both clubs were left frustrated by another call-off. This meant that the clubs had used up the two Saturdays afforded to them under SFA rules and the game would take place mid-week – a nightmare scenario for Vale, with some players bound by work commitments, and others who could get time off needing to be compensated for loss of earnings by the club. An early postponement the following Tuesday, was followed by another nearer to kick off on the Thursday, by which time Vale had made their way to Aberdeenshire, including midfielder Mike Osborne, who had been working during the week in London and endured a ten-hour journey by bus, train and taxi to get there. As the affair generated a fair amount of space in the tabloids, with football pundits such as Bill Leckie and Chick Young devoting space in their columns to offer their opinion on the matter, the SFA intervened to order the match should take place on Saturday 13th December. While the day saw milder temperatures, it also saw heavy rainfall and the sense of relief was palpable as the referee ruled that the Harlaw Park pitch had held up and the game could go ahead. Prior to kick off, a minutes silence was held in memory of Alec Lucas, which was respectfully observed by every single person in the 400-strong crowd. Once the action was finally underway, Vale received an early set back as Locos took the lead in only the second minute as Thanh-Tan Tran, a German student of Vietnamese origin who was making his debut appearance for the club, scored with only his second touch. Danny Milne increased the home side’s lead in the 20th minute, and a Mark Smith double in the second half killed off the challenge of Vale, who came close to a consolation strike as Craig Dewar rounded keeper Andy Reid, but defender Steven Park got back to clear the ball off the line. The disappointment of an exit from the competition was offset by relief that the whole episode, which had been a significant drain on club finances, was over. Back in the league, a victory at Eyemouth was followed by defeat in a hastily arranged match against Tynecastle at Fernieside after wet weather in Kelso put off Vale’s scheduled match. The Tynecastle match kicked off in fair conditions, but the weather deteriorated as the game wore on, with the final half hour played out in near-farcical high winds. In the King Cup, Vale travelled along the road to Peebles for the First Round. In a derby that tends to capture the imagination anyway, the number of players in the Vale ranks who assisted Peebles in being promoted the previous season added extra spice to proceedings. Peebles new-look side were finding life tough in the Premier Division, but competed well in the match, with Craig Dewar’s opener cancelled out by Peebles ex-Vale striker Peter Shearlaw. But two penalties in the second half, both converted by Mike Osborne, saw Vale through to a meeting in the next round with league newcomers Gretna 2008. The game at Gretna’s temporary home of Everholm in Annan saw Vale get off to a good start, with a Mark Brown penalty and a Chris Graham strike putting Vale 2-0 up within 7 minutes. David Reynard pulled a goal back for the home side, but Vale held on in the heavy conditions to secure a Third Round place. Despite the progress in cup competitions, Vale’s league results were mixed with any notion of the club securing a promotion place long since extinguished. Following a 3-2 loss at home to Civil Service Strollers, Lindsay Rathie announced his intention to step down from the manager’s position. Rathie admitted that he had underestimated the demands that running the team would make on him, and wished to devote more time to his young family. The club took the decision to advertise the post, receiving several notes of interest for the managers job and cutting the applications down to a shortlist of three candidates, who were interviewed. Rathie’s final game in charge was a League Cup tie at Victoria Park against Spartans. Vale fell behind to a David Etale goal early in the second half, but strikes from Aaron Somerville and Steven Notman turned the game around and Rathie went out on a high, a fitting reward after all the hard work he had put in to the club during the previous eighteen months. Prior to the Spartans game the club had announced that the new manager would be former Peebles and Lothian Thistle coach Rab Paget. The new man brought with him coaches Stewart Churchill and Stuart Gray, with David McGinley as goalkeeping coach. This meant the departure of coaches Gary Norman and Neil Nisbet, although co-manager Robbie Clark was retained as a player. Paget’s first game in charge was a King Cup game against, ironically enough, Lothian Thistle. The capital side found themselves down to ten men early in the second half, as Martin MacAuley received his marching orders for a challenge on Andy Martin. Ninety minutes failed to produce a goal, but at the beginning of the second period of extra time, John Harvey found the net for Thistle. Vale pushed forward and eventually got their reward when Aaron Somerville incredibly found the net in the fourth minute of injury time, sending the match to a penalty shoot-out. Vale keeper Mark Wilson saved the first two Lothian spot-kicks and although Gavin Tainsh saw his attempt come back off the bar, Ronald Fleming dispatched Vale’s fifth penalty to send them through to a semi final place against Edinburgh City. A Mark Brown header after half an hour at Meadowbank Stadium was enough to see Vale through to a second successive King Cup final where their opponents would be Heriot-Watt University. Vale reached the semi finals of the League Cup after a Chris Graham goal was enough to see off a stuffy Eyemouth United side in the Quarter Finals. Vale faced Dalbeattie Star at Islecroft Stadium, but despite taking the lead through Mark Brown, a double from Scott Milligan made it 2-1 at half time, with no further scoring in the second half. The King Cup Final took place again at Ferguson Park, Rosewell, and in a tight, nervy game clear cut chances were thin on the ground. The game turned on the introduction of Watt’s Norwegian striker Lars Berger who, within five minutes of coming on, put the students ahead. Vale managed a late rally, with efforts from Chris Graham and Ronald Fleming coming close to giving Vale an equaliser, but really it had been a disappointing display and the cup deservedly went to Heriot-Watt. Shortly after the finish of the season, a Vale team took part in the inagural Alec Lucas Memorial Tournament, which took place at a sunny Whitestone Park in Peebles. Vale reached the semi final before losing out to eventual winners the Royal Marines. The event, which included an evening auction, raised an astonishing £18,000, which was divided up between the Royal Marines Benevolent Fund and football causes in Peeblesshire. The Player of the Year awards saw Gavin Tainsh capture both Players and Supporters Player of the Year, while the President’s Player of the Year was Steven Notman, who also shared the Top Scorer award with Aaron Somerville after both had netted thirteen goals. * Vale of Leithen expelled from competition due to fielding an ineligible player. Somerville 4, Dewar * Vale of Leithen expelled from competition due to fielding an ineligible player.